Finally I am posting after moving. Not completely settled yet, but I was able to find everything I needed to bake for the first time in my new home. So happy that the oven keeps an even baking temperature, even though it is off by 10 degrees. I had a craving for honey cake. This cake is traditionally made for the Rosh Hashanah, the Jewish New Year, when you eat sweet things to ensure a sweet year. I decided to use a recipe from Smitten Kitchen’s blog because it looked just like the honey cake I used to love and I trust her recipes to come out well. Of course I had to convert the recipe into a gluten free version. I love the texture and taste of this cake. It is moist and has a delicious spiced flavor. 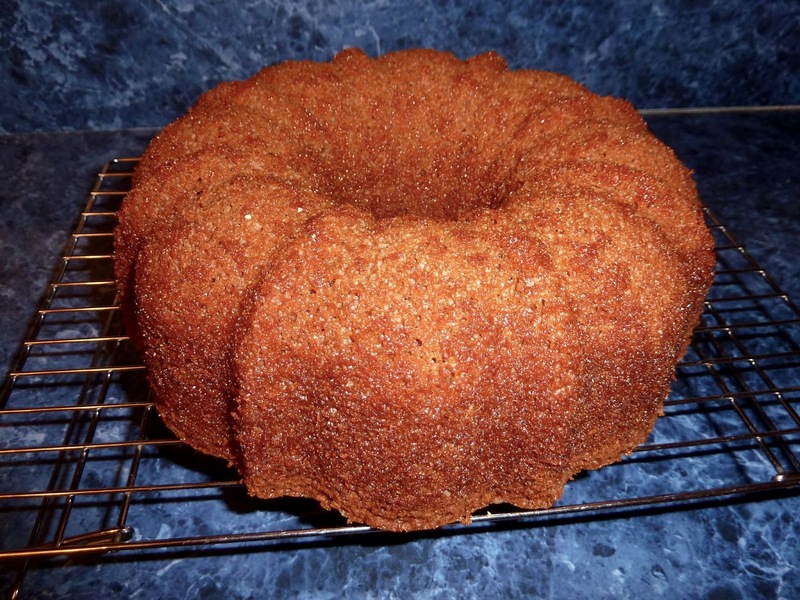 If you prefer a plain honey cake just omit the cinnamon, allspice and cloves. 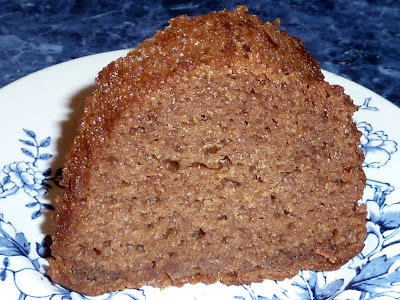 Honey cake can keep for several days at room temperature, but nothing beats the light fluffy texture of a fresh baked cake that is still slightly warm. I usually don’t like things too sweet and this recipe seemed to have too much sugar and honey, so I mixed the batter with one cup less sugar. To my surprise, after tasting the batter, the cake did need to be even sweeter. I added another ½ cup of the granulated sugar (½ cup less sugar than the original recipe called for) and this made it perfect for my taste. I also used evaporated cane juice crystals instead of regular granulated sugar. This sugar has a more natural and less sweet taste. I hope you enjoy this recipe and that you have a Sweet New Year! Makes one 10-inch (12 cup) bundt cake, one 9 or 10-inch tube or angel food pan cake, three 8x4½-inch loaves, or one 9x13-inch sheet cake. Ground Cinnamon (optional) Omit spices if you want a plain honey cake. Pineapple Juice (or Orange Juice) (The original recipe called for orange juice, but I used the pineapple juice that I had in the fridge). Preheat oven to 350℉. Grease the pan(s) generously with oil or cooking spray. Take two baking sheets and place them on top of each other. Baking the cake on top on the double baking pans will insulate the bottom of the cake and prevent it from getting dry or burnt. Unbaked cake in pan on top of two baking sheets. 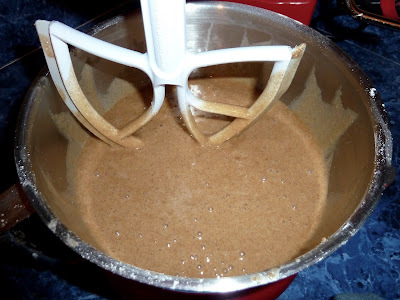 Using a large whisk, mix the flours, xanthan gum, salt, baking powder, baking soda, spices (if using) and sugars together well in a large bowl or the bowl of a stand mixer. Mix the honey, oil, eggs, vanilla, coffee, juice and water (or whisky or rye) together in a separate bowl. Make a well in the center of the dry ingredients and add the wet ingredients all at once. Mix on low speed with the stand mixer or with a sturdy spoon or whisk by hand until the batter is smooth. The batter will be thin and liquidy. Pour or spoon the batter into the prepared pan(s). Sprinkle the sliced almonds on top, if using. Raw batter in a bundt pan. 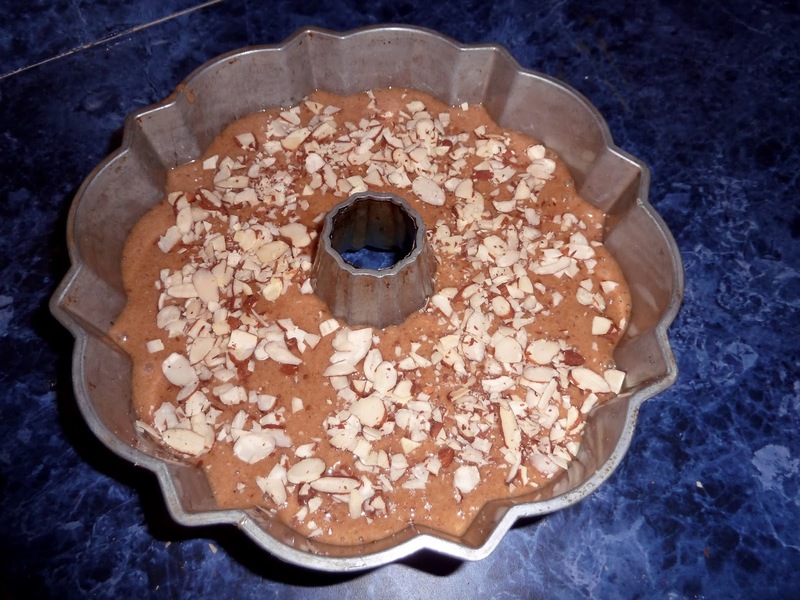 Raw batter topped with sliced almonds. feature of the almonds was lost. Almonds will look good on loaf cakes. The almonds taste good with the cake. Bake bundt, angel food or tube pan cakes for 60-75 minutes, loaves for 45-55 minutes and sheet cakes for 40-45 minutes. Gently rotate the pan 180° half way through the baking time, so that the cakes bakes more evenly. The cake is done when the center springs back when pressed lightly with a finger. Allow the cake to cool in the pan for 15 minutes before turning it out of the pan to cool completely on a rack. Cake in pan after baking. 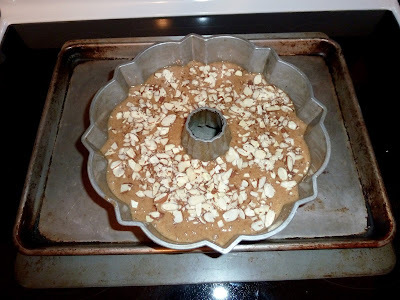 GLUTEN FREE HONEY CAKE Makes one 10-inch (12 cup) bundt cake, one 9 or 10-inch tube or angel food pan cake, three 8x4½-inch loaves, or one 9x13-inch sheet cake. Ingredients 1¾ cups Sorghum Flour ¾ cup Chickpea Flour ¾ cup Tapioca Flour ¾ tsp. Xanthan Gum 1 Tbs. Baking Powder 1 tsp. Baking Soda ¼ tsp. Himalayan Sea Salt 4 tsp. Ground Cinnamon(optional) Omit spices if you want a plain honey cake. ½ tsp. Ground Allspice ½ tsp. Ground Cloves 1 cup Evaporated Cane Juice Sugar (The original recipe calls for 1½ cups of granulated sugar) ½ cup Brown Evaporated Cane Juice Sugar (or brown sugar) 3 large Eggs 1 tsp. Vanilla Extract 1 cup Vegetable Oil (I used canola because it is mild and neutral tasting.) 1 cup Honey 1 cup Warm Coffee or Strong Tea ½ cup Pineapple Juice (or Orange Juice) (The original recipe called for orange juice, but I used the pineapple juice that I had in the fridge). ¼ cup Water (The original recipe called for whisky or rye.) 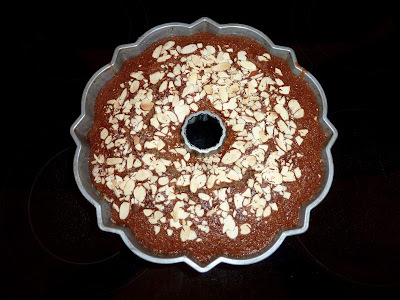 ½ cup Sliced Almonds (optional) for the top of the cake. 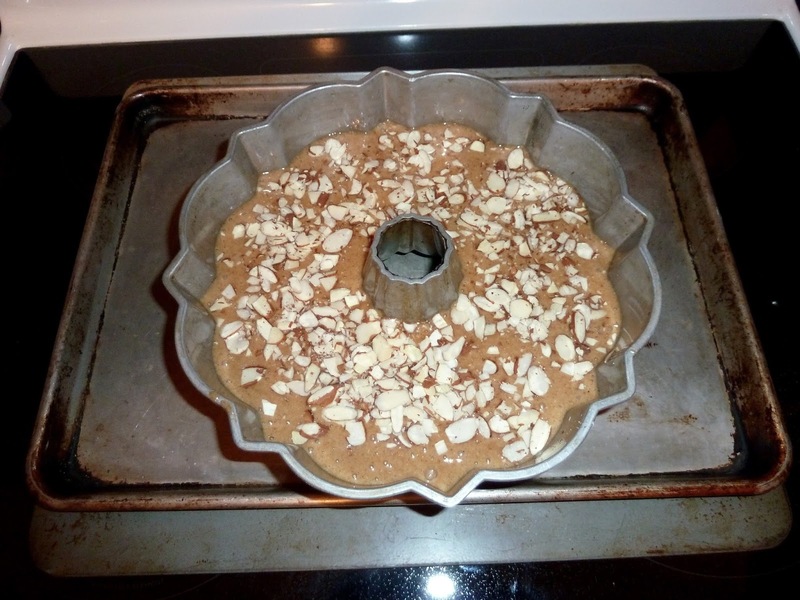 (I used the almonds on top of the cake, but with a bundt cake the top becomes the bottom. 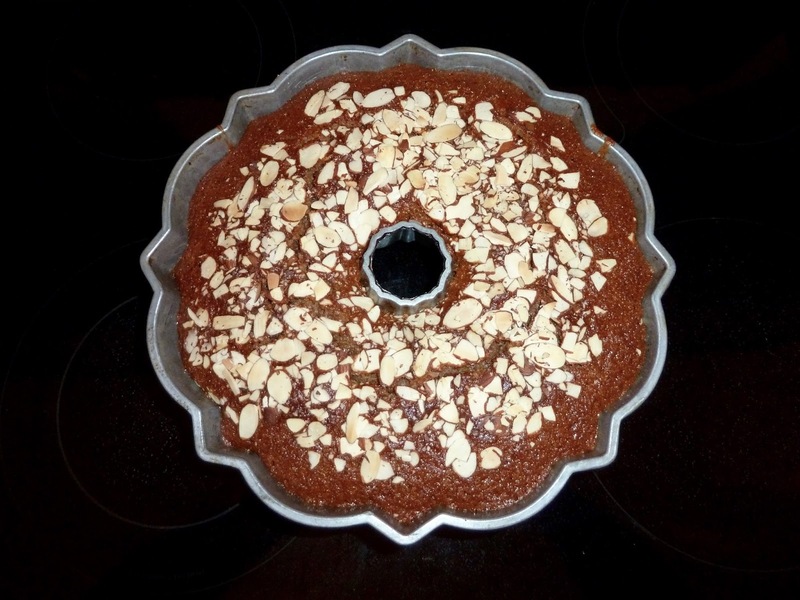 Even though the decorative feature was lost, the almonds did taste good with the honey cake.) Directions Preheat oven to 350℉. Grease the pan(s) generously with oil or cooking spray. Take two baking sheets and place them on top of each other. Baking the cake on top on the double baking pans will insulate the bottom of the cake and prevent it from getting dry or burnt. Using a large whisk, mix the flours, xanthan gum, salt, baking powder, baking soda, spices (if using) and sugars together well in a large bowl or the bowl of a stand mixer. Mix the honey, oil, eggs, vanilla, coffee, juice and water (or whisky or rye) together in a separate bowl. Make a well in the center of the dry ingredients and add the wet ingredients all at once. Mix on low speed with the stand mixer or with a sturdy spoon or whisk by hand until the batter is smooth. The batter will be thin and liquidy. Pour or spoon the batter into the prepared pan(s). Sprinkle the sliced almonds on top, if using. Bake bundt, angel food or tube pan cakes for 60-75 minutes, loaves for 45-55 minutes and sheet cakes for 40-45 minutes. Gently rotate the pan 180° half way through the baking time, so that the cakes bakes more evenly. 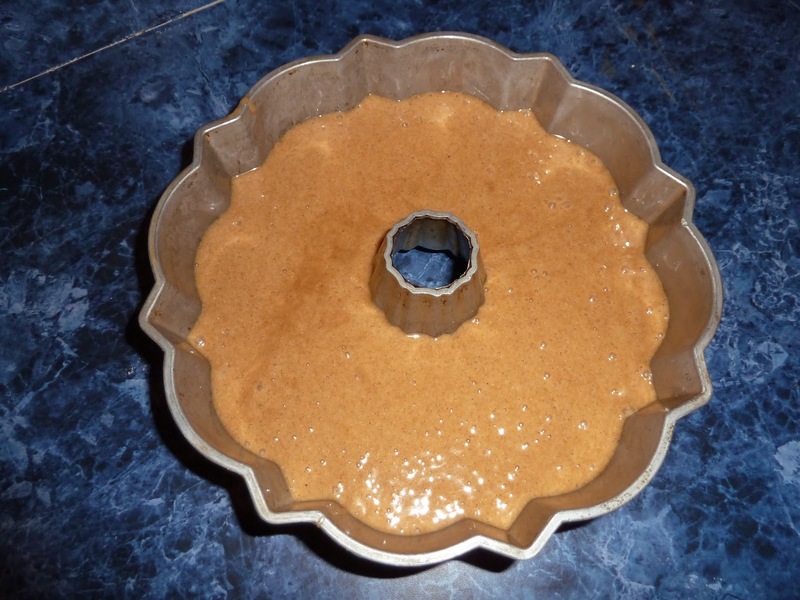 The cake is done when the center springs back when pressed lightly with a finger.